I don't know about you but I am one of those people that puts everyone's needs and wants before my own. Sometimes this can be very detrimental. When I do put myself first and tell one of my friends (all two of them) what selfish thing I did, they usually tell me it doesn't count. Like if I buy hair conditioner for myself while I still have some. Or if I buy dryer sheets because they are marked down and I still have some. Yup I'm a wild and crazy gal. A four bedroom old fashioned house. I want it to have a fenced back yard with room for the Wee Ones to play, and room for a small garden. I want it to be neat and be decorated smartly. A craft room or craft studio. Doesn't this make you want one too? To live somewhere where the weather is moderate. Not too hot or to snowy. Oh and some place within easy driving, if not walking distance to the ocean. The time to be able to complete the craft projects I am working on and that I have been rolling around in my noggin. Like the quilt I want to try. This has made me want to try my hand at quilting again. AVW Bus, like this or a VW Bug, like this. A new computer for The Boy. Tricycles for the Wee Ones. A red wagon for the Wee Ones. How about you? What do you want? I have been a intermittent reader of the knitty.blog, by the wonderful Amy Singer. 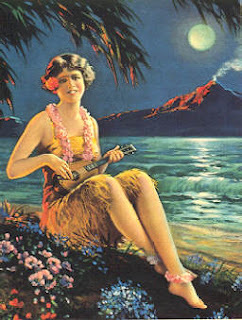 I read how she has recently took up playing the ukulele. Yes that's right the ukulele. I guess she used to play the flute, but decided to try her hand at strumming the ol' uke. Reading this got me thinking...hmmmm...I have always wanted to play the guitar. I tried playing a guitar a couple of years ago and didn't enjoy it very much. The neck was too wide for me to comfortably fit my hand around and the strings were so hard to strum/pick or fret that I quickly gave it up. Then I read about the ukulele. I have found a wonderful little off beat and touching comedy, called "The Ramen Girl". I discovered it on Netflix when I was browsing through the instant play shows. At first I kept passing it up. I read the teaser on it, but saw that it had Brittnay Murphy, and since I'm not a fan of any of the movies I have seen her in I would just leave it alone. Then one night The Boy came down to watch a movie with me. We had chosen one that was supposed to be a comedy. It's called "Numb". To call it a dark comedy was an understatement. We did not like it all. It was just too dark and not very funny. After watching that movie it was quite late and so I decided to go to bed. I showed The Boy how to select and set up another movie to watch. First let me say that our oldest son has always been interested in Japanese and Asian culture, and loves ramen. So I suggested "The Ramen Girl". I ended up sitting down and watching it with The Boy. I'm glad I did. It totally changed my opinion of Brittnay Murphy. Now don't get me wrong it's not a deep involved movie that is going to change the world, it's just a simple story that drew me in. Has anyone else seen this movie? What did you think of it? If you haven't seen it yet, I recommend you do. Of course you would have to be open to read subtitles, unless you are fortunate enough to understand the Japanese language. First let me say how much I appreciate you all for giving me a virtual pat on the back. It helped a great deal. It also enabled me to go and speak to my husband (he has not yet earned his Dh moniker back yet) about how I was feeling. I was able to approach the subject without tears or attitude. Which is extremely important if I really want him to hear what I say. He was good enough to reiterate his dedication to helping me out as far as responsibilities and our plans to move forward instead of being stagnate here. It was a short conversation but I felt he meant what he said and he said it in front of The Boy. Which might seem inconsequential, but it means a great deal to him if he makes assurances in front of The Boy and then not carry through on them. So I feel a little better today. It also helps that it's been raining on and off all day. I like this weather much better than hot weather. I always feel like I'm melting in hot weather. Plus it makes everyone cranky around here. I did forget to mention something I did do for myself recently. Background info first; My DFaN went and cut off her hair. It looks really cute on her and it looks different from anyone here. She kept saying how she got to looking at all the women here and everyone seemed to have the same hair style. Long, fairly straight, and either worn down or up in a ponytail. The same way I was wearing my hair. On the Fourth of July she decided to take a photo of herself and her oldest daughter. I wish I had a copy of it, but unfortunately I didn't get one. Anyway, she then decided to get a photo of the two of of us. I hate my photo taken. As I have said before I never look like I think I do, or how I look in the mirror. But seeing that photo (on her digital camera) I saw my hair and made the decision to cut it. Luckily my Mum used to be a beautician and was able to cut my hair as per my DFaN's suggestion. Now I don't have a before photo, yep that is still with my DFaN, but I asked my husband to take a photo of me today with my new Do. I like it. It's feels oodles better. It was funny after I got my hair cut I was at the market and looked at all the females. They all had the same hair style as my DFaN had mentioned. I was so relieved to have a different look. Ok so that is the best one I could come up with. No that's not a wart on my nose, it's my nose ring/stud. Yes I did pierce my nose. I'm crazy like dat. I wanted to touch base with anyone still out there that might be checking in on my blog. I'm still alive. I wish I could say that my lack of witty and urbane posts are due to my busy schedule with having ever increasing amounts of fun and frivolity. Alas this is not the case. Unfortunately things in my little life are just not going according to plan. Which is not a new thing. I had proudly announced that my husband was going to start attending college, since he was unable to locate work. Well that sure has NOT gone well. He ended up having a series of doctors appointments, that all but killed any chance of him doing well in school. We have our medical insurance for a limited amount of time. So he was trying to take care of all medical issues. Something he has NEVER had in the 16 years we have been together. Something has happened to one of his eyes. The Doc said that it is an occlusion. He said what kind but I can't remember. My husband describes it as looking through fabric. The Doc says to wait to see if it clears up, yet so far it's not and it may be getting worse. I have to admit that I am greatly disappointed in him and what he said he would do. I realize that it could not be avoided but so much could have been done better. My husband and I have been through some tough spots in our relationship. I so wish I could say that these 16 years have been a wonderful romantic dream. I often find myself having to bail my husband out of some predicament. I have to figure a way to steady our quickly tilting world. I have to be the one to solve our problems. It's a burden that I didn't want to do anymore. A couple of years ago we separated for about a year. We reconciled for our children and our friendship. Yes there was love but we have always been good friends. Plus he was about to lose the place he was staying and would be homeless. I couldn't let happen. When he moved back in with me I told him I didn't want to fix everything anymore. That I wanted him to help me out and make things right. He said he would. I'm still waiting. I have been trying not to be Super Woman, as per my husband. But with the way things seem to be going I am going to have to be the one, yet again, to fix things. (sigh) So I apologize to anyone out there who has noticed a lack of me commenting or a lack of new posts. I just don't seem to be able to feel very positive lately. Sorry.